Micro&Nano 2007 Conference - Welcome! 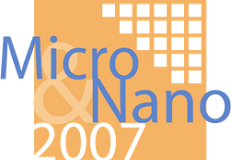 Micro&Nano2007 is the third of a series of Conferences on Micro- Nanoelectronics, Nanotechnology and MEMs, held at NCSR “Demokritos” in Athens-Greece. This year the Conference will be organized by the Greek National Scientific Society “Micro&Nano”. The Conference aims at gathering together in an interactive forum all scientists and engineers working in the challenging field of Micro- Nanoelectronics, Nanotechnology and MEMs and to stimulate discussions in last achievements and new developments in this rapidly evolving field. The Conference will combine an extensive scientific programme including oral and poster sessions, exhibition and social events. The Conference will be held at the Conference Center of NCSR Demokritos in 18-21 November 2007.